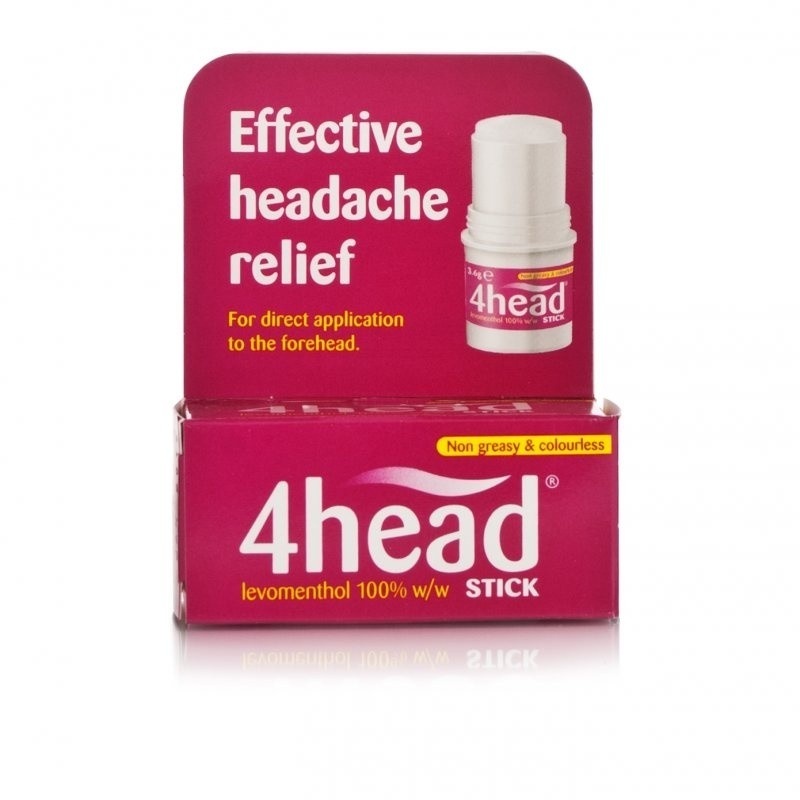 Unlike most headache treatments, 4head Stick is specially designed to be applied directly to the forehead. It contains 100% pure levomenthol (a type of peppermint) in a convenient retractable stick dispenser. Helps to avoid the side effects that can be associated with taking painkillers orally. Can be applied whenever required, so there’s no need to wait 4 hours between treatments. Convenient and portable. The neat and handy applicator stick is convenient for use whenever a headache creeps up, whether at work, home or on the move. Cosmetically acceptable. 4head Stick is specially formulated to be non-greasy and colourless on application, and it shouldn’t interfere with make-up. No need to swallow tablets, pills or caplets – avoids the inconvenience of having to swallow these with a drink or food. Ideal if you have difficulty or dislike swallowing headache pills. How does 4head Stick work? 4head contains a powerful natural painkiller - 100% levomenthol - that can help block pain signals caused by tension headaches and relax the muscles in the head. After swiping 4head Stick across your forehead, you'll quickly feel soothing cooling and tingling sensations. These are the first signs that 4head's analgesic action is starting to work. In fact, a clinical trial with tension headache, sufferers confirmed that after applying 4head they could feel the effects of its powerful natural painkiller, pure levomenthol (peppermint), getting to work in just two minutes. Are there any limitations on the age of patients using 4head? 4head can be used by adults, the elderly and children. However, when young children complain of headaches, it is normally appropriate to discuss this first with their doctor. How often can 4head be used? 4head can be used as required. If local sensations cause concern, subsequent applications should be less frequent or applied over a smaller area. In rare instances of more severe reactions, use should be avoided unless on medical advice. Will 4head react with any other medicines, either oral or topical? There are no confirmed reports demonstrating evidence of interactions between the use of 4head and other medicines. However, 4head should not be used at the same time as any other treatments applied to the forehead or if there is any skin condition present on the forehead. Can 4head be used at the same time as oral analgesics? Yes. There are no confirmed reports demonstrating evidence of interactions between 4head and oral analgesics. Can 4head be used by patients with asthma? Although there are no confirmed reports demonstrating evidence of complications when 4head is used by asthmatics, such patients should take care to use it in a well ventilated area. Can 4head be used by diabetic patients? Can 4head be used when acne, eczema or other skin conditions are present on the forehead? 4head should not be used if the skin of the forehead is cut, broken or abnormal in any other way (e.g. cases of acne, eczema or other skin conditions). Can 4head be used during pregnancy/breast-feeding? This product can be used during pregnancy and while breast-feeding. The ingredient has been in widespread use in this and similar preparations for many years, without significant adverse reports. However, safety trials have not been conducted. 4head is for fast, effective headache relief without tablets. application is colourless and non-greasy, and leaves no sticky residue. associated with aspirin, NSAIDs (e.g. ibuprofen) or paracetamol. Adults, the elderly and children can use it - although when young children complain of headaches, it is normally appropriate to discuss this first with their doctor. As with any medicine, excessive use should be avoided. The same instructions apply to adults, children and the elderly. Remove outer cap and, before use, also remove the small protective inner cap from the top of the dispenser. Twist the dispenser base clockwise, whilst holding the upper section, until the levomenthol stick protrudes from the top of dispenser. Apply gently across the forehead as required (taking care to avoid the eyes). Do not use too much otherwise the skin sensation may become excessive. If this occurs, subsequent applications should be less frequent or over a smaller area. After use, retract into dispenser and replace caps. 4head Stick must only be used on the forehead. Stop using 4head if it feels uncomfortable. If you experience any other undesirable effects, seek medical advice. If 4head is accidentally swallowed, seek medical attention.